It’s Slow Stitching Sunday over on Kathy’s Quilts, celebrating all things hand-stitched, I’ve been making steady progress with my stitching this week, both hand and machine. I’m trying to get a few finishes under my belt at the moment, I suddenly had that epiphany moment when I realised I’d got four quilts and three embroideries on the go, never mind two dress-making UFO’s lurking in the corner of my sewing room. I want to get a few things finished before I start Helen’s new quilt…and before I go to the Knitting and Stitching show at the end of November as I’m bound to find a new project there! The stitching for my Summer in the Dales box is almost complete, I’ve just got to finish the green line and add one line of pink back-stitch and a bit of gold and that’s it, finished, ready to make up into the box. The words go round the inside rim of the box. I’m probably a quarter of my way through embroidering the latest Anderson’s Farm quilt block, these never take as long as I think they will, so I just need to crack on with it. I’ve another embroidered heart and a little pieced block to make too before I’m up to date. The final installment will be arriving soon so I would like to get this months block finished this week. The Splendid Sampler quilt-a-long has been mainly pieced blocks recently but there was one appliqued block for me to blanket stitch round. It was of a five petalled rose so it just cried out to be made into a Yorkshire Rose. 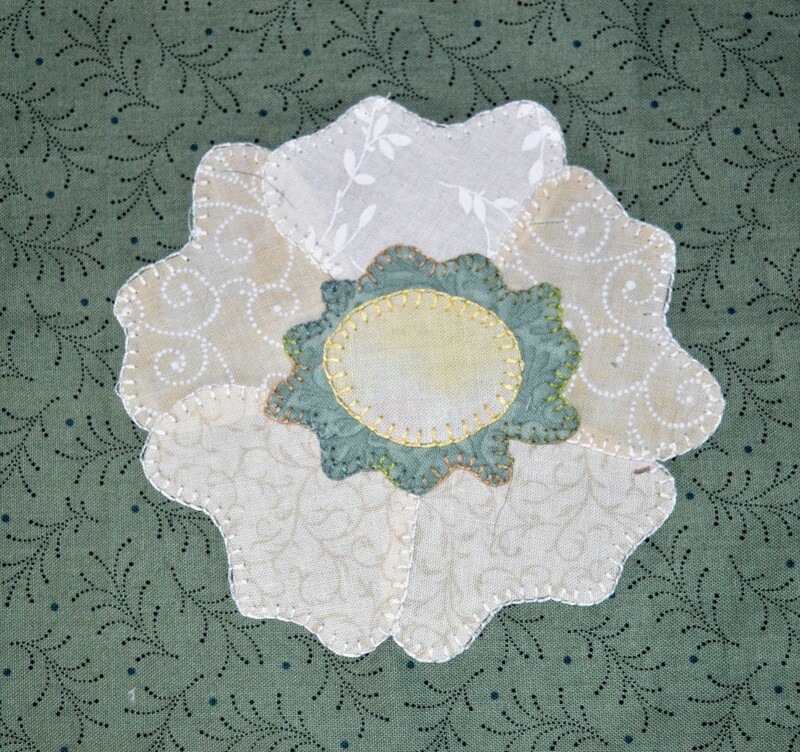 The white rose of Yorkshire is the emblem of our county, going back to the 14th century at least. I’ve got two quilts almost finished, one is from about three years ago, delayed for various reasons, but now it just needs sandwiching and quilting, the disappearing four patch I started last week just needs it’s final border and then quilting, I’m hoping to crack on with that today. 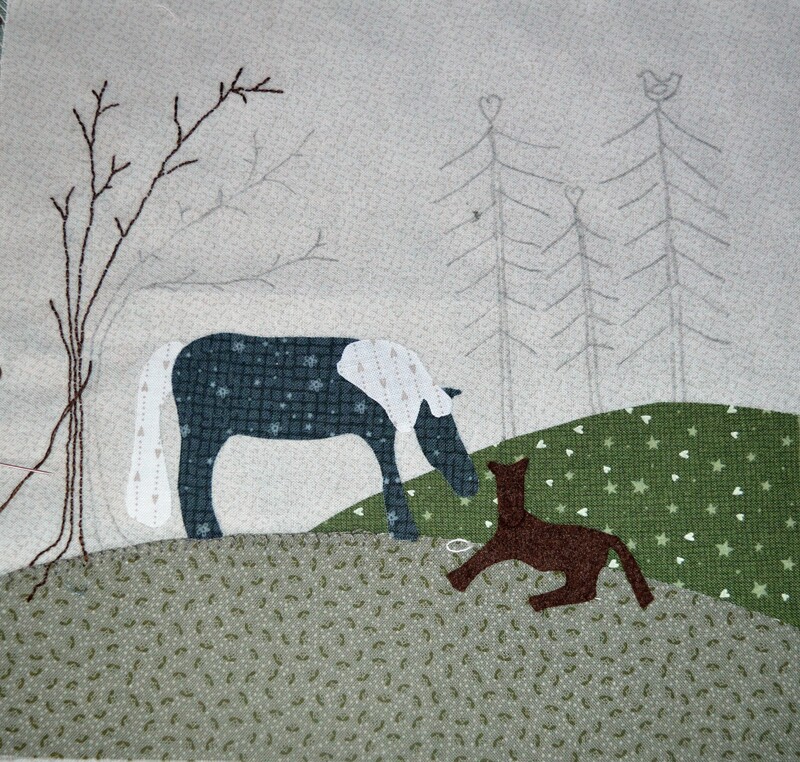 …with a bit of concentration I could get two embroideries and three quilts finished in the next month! Whilst I’m sewing today I’m going to listen to a programme on BBC i-player called Song of the Singer Sewing Machine. It’s about an hour long and apparently it’s all about the history of Singer sewing machines. I’m hoping to learn a bit more about Pearl, my fiddleback singer. This entry was posted in embroidery, Quilting, Serendipity, Splendid Sampler Quilt and tagged Anderson's Farm, cross-stitch, My Splendid Sampler, Summer in the Dales. Bookmark the permalink. Those are all great projects. I hope you have some finishes to show soon. I was recently looking at my own WIPs realized that some finishes were necessary. Your rose is very pretty and I like the simplicity of that farm block. These are lovely projects that you’re working on. Great projects. And that is a wonderfully preserved fiddlebase Singer. Really enjoyed listening to that BBC programme – thank you for mentioning it! Thanks for the link… I would like to listen to it too! What a lovely machine you have! What brilliant projects! I definitely know the feeling of having many projects on the go at once. I think you are doing incredibly well! CurlsnSkirls told me you had a Singer Fiddlehead. Pearl is beautiful! In such lovely shape too! I’ve just started with VSM. I have a treadle Singer, a Featherweight and a Singer Slant-oMatic and a Forde Deluxe. They have been blogged about. I’m going to follow you to see what you get up to! Beautiful quilting too! Thanks Linda, I was having a look at your VSM’s this afternoon, love your featherweight, that’s next on my list but don’t tell my OH 🙂 I clicked to follow you on wordpress, but it didn’t seem to do anything, I’ll check later! You are following my blog by email now. You will get the posts by email. I found it easier to follow your blogspot by email too. Sometimes one way is easier than the other. Be patient, you will get the VSM you want someday. For me it was just luck! First there was nothing out there and then BOOM there it was so I grabbed it! Happy Sewing to you! I love that rose, a beautiful block! I am hoping to pop out a few more splendid sampler blocks this week, hopefully! You have lots of projects to keep you busy and entertained! Can’t wait to see the finished box project.